In Kennedy Town, change continues apace. Talk of halcyon days is just that – talk, and reminiscences of an era already folding into the past. Those old clusters of Bauhaus architecture have made way for high-rise developments, while hipster eateries scatter the streets left, right and centre. But has Hong Kong’s latest hip and happening district already reached saturation point? 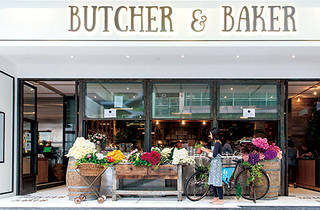 If Castelo Concepts’ latest venture, Butcher & Baker Cafe, is anything to go by, the answer is not quite yet. 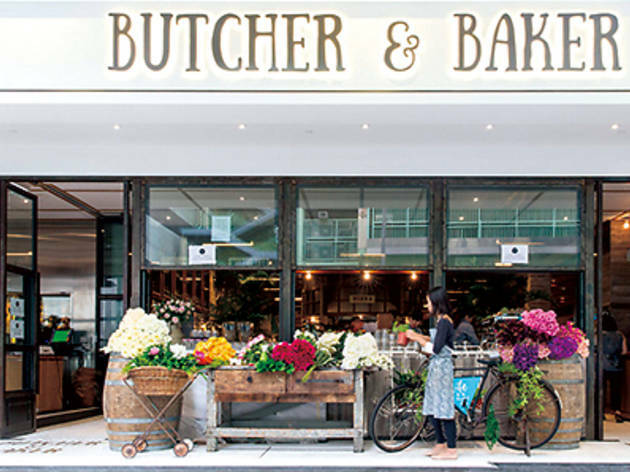 An impressive physical feat, at least by Hong Kong standards, Butcher & Baker Cafe occupies a staggeringly large yet not overfilled space – patrons are seated comfortably amid the open bakery and butcher’s counter that share the space. The open plan restaurant oozes rustic charm, with fresh fruit and vegetables placed in baskets next to diners’ tables. The key here is in the details, with meat cleavers decorating the bathrooms and a kids’ corner that’s fun enough to make even the grownups run amuck. To start with, we order the sausage sampler platter ($120), a dish quickly gaining a reputation as the must-order at Butcher & Baker. From the selection of daily specials, we choose Cumberland, spiced beef and lamb sausages – plump, juicy links packing some serious flavour. Though the beef sausages burst from their casings, we still find it hard to complain. Next, we opt for the Mayno’s steak sandwich ($165), tender morsels of beef served with back bacon and the most moreish onion jam we’ve had in years, all complimented by bread that perfectly soaks up the sweet juices. To rounds things off, we head over to the bakery where the day’s desserts are on show. We go for the apple pie ($95), served in a small iron skillet. As we sit and await our order near the bakery, the smell of cinnamon wafts over to our table, stirring our appetite. Definitely more of a crumble than a pie, this is a refreshing way to end the meal, though it’s the butcher rather than the baker who’s stolen the favour of our stomachs tonight.